This entry was posted on Friday, March 11th, 2011 at 5:00 am	and is filed under Childhood, Parenthood, Psychobabble, Reading. You can follow any responses to this entry through the RSS 2.0 feed. Both comments and pings are currently closed. This is one of the few things I think I’m okay at… and it’s not through anything but sheer inertia and, possibly, laziness. My kids play alone a lot – in their rooms, in the front yard (which is basically on the street), at the park. I even let them walk the three blocks home/to the park alone. I have often enjoyed a solid 20-30 minutes of reading at the playground/park while they run around. Other parents routinely comment on how well my children play alone, and I usually make some crack about “if you ignore them long enough they learn.” But I think there’s truth to that, actually. My daughter is in 2nd grade and most of her classmates have an afterschool enrichment activity at least 4 out of 5 days and she has only one (which I’ve basically had to convince her to keep, fearing total lack of socialization). She prefers to hang out at home, to play outside or in her room. I could not agree with this more. And am so grateful that you wrote about it! This is so tricky, and more culturally ingrained than we realize. I was of the “half-an-eye” on the kids parenting variety; my ex was of the “no-eye-at-all” sort, which I considered ridiculous, but it was the way he was raised, and not in the US. As for free play, I am not of the “free range” variety. I am all too aware that the world is more dangerous than it was a generation ago, with variations depending on location. But I do believe that our hovering constantly is detrimental. That sense that if we aren’t participating that we are deficient in our parenting. I chalk some of that up to the “be present” movement (which irks me), and a slow encroachment of subtle narcissism in our parenting styles that makes it all about us, even as we operate under the guise of it being about them. I don’t feel as though I’m expressing this clearly (rough night). Netting it out: kids need time to be kids, parents need to be watchful, we don’t need to take our sense of self from involvement in their free play. BLW – I think you raise an interesting point about the “slow encroachment of subtle narcissism in our parenting that makes it all about us.” Perhaps this is a key underlier to my hypothesis. Because we want to feel righteous as parents we are inclined to hover even when we know it’s not good for our kids? May well be. Thanks for the comment. Mama used to say, “bordeom is the path to invention.” Maybe she was right or maybe she just needed an excuse for our mayhem. I’m not sure. I’ve commented here about free play before too, so I don’t want to get too much back on my soap box. As parents we let our 2 children engage in free play and often times we play with them in a way that is not directed by us. I love seeing what they choose to do like snuggle, dance, create a play, read a book, build a house for a caterpillar, make up a song, build a fort, etc. I think it is easier to settle into free play when you have more than one child (so Gale you should give yourself a little break here). When we just had our daughter, I felt guilt if I let her play by herself so I could read a book and so she didn’t have many chances to play alone at our house. But it’s easier for our family now that we have 2 children who engage in free play together. 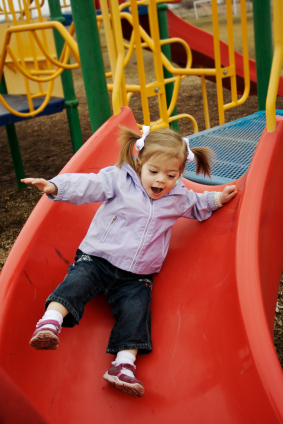 I think it has been known for quite some time that free play is important – especially for young children. Most widely-accepted educational philosophies for young children are child-centered and play-centered. I think the key is for parents to educate themselves about free play. Choose a preschool that is child-centered and play-centered and that supports the school-home connection so that these practices are easily carried forward into your home. We want our children to succeed, so perhaps it is easy to fall for the preschool that says they’ll teach your child to read before kindergarten. But what I’ve found is that learning through play teaches children to be creative and to be lovers of learning – characteristics that will stick with them their entire lives. While elementary schools and beyond have so much to teach that they often have limited free play time, one of the character education lessons that is taught at my daughter’s school is to be proactive – you’re in charge. If you are bored, find something to do and don’t expect a parent or adult (or TV or video games) to entertain you. And finally, I’d like to interject that somehow everytime you write a parenting post on which I comment, I always end up talking about my kids’ schools. I think this is because we use two schools that have very strong school-home connections. I’m not trying to get off topic and talk about school, but I think what school does and what we do in our home are so parallel that it just happens. Sorry for that Gale! Laura H – No need to apologize. I think that schools play a big role in this too. And factoring the issue of play into our decisions about our kids’ schools is important. As for the single vs. multiple kids thing. Yes, I try to interact with IEP quite a bit now for a couple of reasons. First, he is our only child and while he does do a good job of playing alone to an extent, I can’t ask that of him all the time. Second, and perhaps even more important, he’s only two. He’s at just the right age to get himself into trouble that could be dangerous. So at this age I would never let him get too far from my sight because it isn’t safe. When he gets a bit older that will be less of a concern. Also, for single-kid families I suspect that unguided play dates are also immensely valuable. I remember having friends over and going to friends’ houses after school all the time as a kid. (They weren’t called play dates then, but that’s basically what they were.) We’d have an after-school snack and then go off and play on our own for a couple of hours until someone’s mom picked her up. Parents were never involved. Lastly, I love the idea of teaching kids to be proactive; that it’s their responsibility to find something to do. I don’t even have kids yet, but when I’m with other people’s children at a playground (or with family kids), I feel like people are judging me for being uninterested if I stand back. I totally feel guilty if I’m not up in there swinging from the monkey bars myself. This is really interesting. I can see big differences in my kids’ personalities between the first and the last. The oldest is always “bored” and as a younger child, really required my attention (or at least that’s what I thought). The youngest can play for hours on end and I think it is really because, as the third kid, I naturally did not have as much time to “hover”. Cathy – Thanks for this perspective. For me this is all still theory since we are a young family. I always appreciate hearing from people whose kids are older and can speak from greater experience. Gale, I’m in your boat, with the young family. I can’t very well take my eye off my 14 month old for more than 5 (or maybe 3?) seconds or he will cheerfully and industriously be trying to maim or kill himself in some new and difficult-to-imagine way. So right now it is just about developmental stages. But one thing I hope I can overcome in the coming years is the guilt I have as a full-time working mom & the overwhelming urge to soak up every second when I AM there. My husband and I literally swarm on him the minute we get home & he has our full & undivided attention for the 60-90 minutes until he goes to bed. I’m worried that this constant attention is going to affect his personality & his ability to be self-sufficient. Though I suspect that having a sibling to divert our focus will even it out soon enough! Ana – I know what you mean about making the most of the after-work and before-bedtime hours. I feel the same way. I suspect there will come a time when I take a sabbatical of sorts and stay home for a couple of years. But in the meantime I definitely treasure all the time I have with him. I think taking age into account is essential here. Little ones need more close supervision. Our playground has equipment that is really geared for big kids, so we follow our two year old around as spotters. But, I don’t direct her play. I just warn and then catch her if she decides to step into thin air. My five year old runs freely, with half an eye on her. When she was one and a half we started at a preschool that really shaped my parenting in wonderful ways. The teachers (and parents since we served as aides in the coop) used only positive discipline (saying what to do, instead of no) and encouraged the children to solve their own problems. First, you have to let them try. Standing back is hard as a parent. Mine are nearly four years apart. I think somewhere between two and three years old it was easier for one to play alone, so don’t be hard on yourself. And focusing on you kid that hour or so you are with them? Oh, don’t criticize yourself for that Ana or Gale. Clearly I think free, independent play is important, but so too are spurts of undivided attention. Here’s something related I’ve noticed lately. I overheard a mom telling her child no no, don’t climb the tree, you’ll break you leg. Don’t run in the grass, you, trip and fall. Don’t play on that, you’ll pinch yourself. She is playing up the worst that could happen., making the world full of danger. I know this voice, it’s part of anxiety. No wonder children don’t know how to act independently between the messages of do this exactly this way and danger, danger, danger.